When back in the States, we knew that our Fergie was the dominate cat of our three old girls. After her passing and that of her sister, Diana, our 13 year old, Jadzia, hasn't seemed interested in interacting with the young ones that we have adopted. She snarls at them. She seems to be content to rest her old bones and occasionally she will come to us for some loving. Memo and I have been joking that it seems that Moinie is auditioning for the position of head cat. Of course, I am the head cat. She and Memo are actually competing for the second spot in our pride. 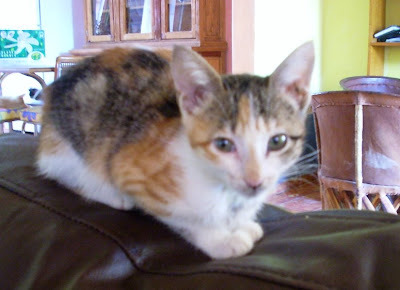 However, Moinie has been the one kitten that is dominating her sisters, the oldest adoptee, and the other young ones. She is adorable. Our baby, Helena, passed away last night. We are grieving. Fortunately, we are able to hold on to the thought that she wasn't expected to survive placement at Anita's Shelter and we did our best to help her for the two weeks that she shared our sandbox. She was a beautiful kitten. I've never had these experiences of loss with pets. Fergie and Di succumbed to old age, Izzy (the First) fought leukemia, and now, Helena's life was cut short by, it seems, any number of things that reduces the life expectancy of a litter of critters. One of Anita's helpers told us yesterday that she hadn't expect our Helena to survive. Two of three kittens that she took home to foster two weeks ago also died. I decided yesterday that I would "cocoon" today. We have a good supply of comfort foods. The water guy came today. The house is clean and the dishes are done. And, Bill is forced to rest today (and many more to come) as he is still fighting an illness. I'm done for now. It is my turn to rest, cry, and get stupid. That is Moinie in the picture above. She is one of three calico sisters that also were not expected to survive in the shelter. She and her sisters have their own survival story. I am thankful that they are now healthy, happy, and very very active.